Melissa Katsoulis named "twenty-five films that made it from the book shelf to the box office with credibility intact" for the Daily Telegraph. 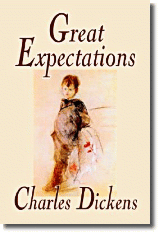 No film version of Dickens has ever matched Lean’s superlative realisation of Great Expectations. From the jumpy graveyard scene to the weirdness of Satis House, and with actors such as John Mills and Alec Guinness giving their all, there is no level at which this utterly brilliant film doesn’t deliver. Read about another book/movie on the list. The adaptation is Erica Wagner's "best film of the book I’ve seen." Great Expectations also made John Mullan's ten best list of fights in fiction, David Nicholls' top ten list of literary tear jerkers, and numbers among Kurt Anderson's five most essential books.